Under normal circumstances, oxygen is transported throughout the body only by red blood cells. With HBOT, oxygen is dissolved into all of the body's fluids, the plasma, the central nervous system fluids, the lymph, and the bone. It can be carried to areas where circulation is diminished or blocked. In this way, extra oxygen can reach all of the damaged tissues and the body can support its own healing process. The increased oxygen greatly enhances the ability of white blood cells to kill bacteria, reduces swelling and allows new blood vessels to grow more rapidly into the affected areas. It is a simple, non-invasive and painless treatment. There are two basic types of HBOT— 'high pressure HBOT' and 'mild HBOT'. With high pressure HBOT, treatments are delivered in a hard-sided chamber typically at pressures greater than 1.5 ATA and using 100% oxygen from oxygen tanks. Mild HBOT refers to hyperbaric oxygen therapy at lower pressures, typically 1.5 ATA or below, and the use of an oxygen concentrator delivering 90-95% oxygen inside a soft or hard chamber. While high pressure HBOT with 100% oxygen may result in greater oxygen saturation in the tissues, many conditions respond better to mild HBOT. In clinical trials regarding neurological conditions to date, there has been virtually no difference in clinical outcome between mild HBOT and high pressure HBOT. We have the most modern and comfortable hard-sided mild HBOT chambers available for use. They provide a graded pressure increase up to 1.5ATA in pressure which is like being 5m under the sea. We use powerful 10 litre oxygen concentrators to provide 93% oxygen and medical grade silicon tubing and cannulas or masks for your oxygen delivery in the chamber. In our chambers at 1.5ATA and breathing in 93% oxygen, your plasma and tissue oxygen saturation is calculated to increase by 5-7 times. That is an average increase of 500% more oxygen than usual being delivered to your tissues. ​How should I expect mild HBOT to feel? How do I get to access Hyperbaric Oxygen help for my health? Do I go on the QRS mat before or after my HBOT session? Can I communicate when I am in the chamber? Can I control the chamber myself? What does mild HBOT treatment cost and what time are the sessions? Can I make an appointment to use the QRS mat only? What does the mat treatment cost on its own? Can I rent a QRS mat? It’s hard for me to afford the treatment I need, what can I do? Mild HBOT is widely promoted overseas and utilised as a preventative, recuperative, and restorative therapy for a wide variety of diseases and conditions. It is also used by athletes to enhance performance and speed healing time; it is good for you! ​What conditions are treated with HBOT? ​Hyperbaric oxygen therapy is used internationally for more than 80 different conditions. Research variously supports its use for athletic injuries and performance, arthritis, autism, attention deficit disorder, auto-immune disorders, Bell’s Palsy, brain and head injuries, cardiovascular disease, cerebral palsy, Crohn’s disease, dermatological conditions, diabetes, dementia, interstitial cystitis, irritable bowel syndrome (IBS) and ulcerative colitis, Lyme disease, learning disabilities, macular degeneration, migraine, multiple sclerosis, neuropathies, pervasive development disorders, PTSD, reflex sympathetic dystrophy, reconstructive surgery, spinal cord injury, stroke, and more. Research is showing that it may be effective as an anti-aging and cancer prevention strategy. Research shows it also works alongside chemotherapy treatment to improve the tumour cell killing effectiveness by 30%. High pressure HBOT is FDA approved to treat air or gas embolism, carbon monoxide & cyanide poisoning, crush injury, acute traumatic ischaemia, decompression sickness, delayed radiation injury, diabetic foot ulcers, enhanced healing of problem wounds, exceptional blood loss, gas gangrene, intracranial abscess, necrotising soft tissue infections, osteomyelitis (refractory), skin grafts and flaps (compromised), and thermal burns. All other conditions treated by hyperbaric chambers are considered off-label uses. Many of these uses are quite commonplace in countries such as the USA, Russia, China, Japan, Italy, Australia and the U.K.
​During your HBOT session you will be lying down inside the chamber, relaxing comfortably with your head supported by soft pillows. While inside the chamber you can rest, read, meditate or take a nap. Although the chamber is warm you will be offered a blanket. You will breathe concentrated oxygen (90-95% O2) through a cannula or face mask. One of our fully trained technicians will be with you throughout your first ’dive’ and will be in constant communication with you during this time and subsequent treatments as required. They will gradually pressurise the chamber up to 1.5 ATA and will keep checking with you to ensure you are completely comfortable. If you wish, your technician can teach you how to have complete control of the pressure in the chamber. You are also able to contact an assistant with the buzzer and speak with them on the built in intercom at any time. You may hear a variety of noises: the sound of air moving through pipes and valves and some clicking noises. Whenever the chamber reaches a new gauge of pressure, it is maintained by ‘flushing’ of air out of the tank via a vent. This is all part of normal operation. As the pressure in the hyperbaric chamber increases, the volume of air in any air spaces in your body is affected. The major air spaces in your body include your lungs, middle ear, gastrointestinal tract, and your sinuses. Your body is capable of equalising most of these air spaces by breathing normally. You may feel fullness in your ears similar to what you may have sometimes experienced in elevators or flying in an airplane. This pressure can be relieved by a simple equalisation procedures that your technician will show you prior to your entering the tank. They will monitor you and will not continue with pressurisation until any discomfort has gone. If you have mild congestion, you can still go ahead and benefit from a dive at a slower rate of compression. A dive at 1.2 ATA vs 1.5 is still therapeutic should discomfort prevent further compression. EarPlanes ear plugs are used for flying and are available to purchase but ear problems usually resolve after the first few dives. If you have problems equalising or a history of ear infections and/or glue ear, our osteopaths can use gentle techniques to assist the opening of the eustachian tube which drains your middle ear, allowing your ears to equalise more easily. heat of compression. As pressure decreases temperature will decrease as well. During and directly after descent or pressurisation you may notice that the temperature increases. During ascent or depressurisation you may notice that the temperature gets slightly cooler. There is a blanket in the chamber if you are feeling cold. If you are experiencing any parasitic or microbial infections such as Lyme disease or Candida, you may experience a temporary exacerbation of symptoms early in treatment as those organisms die off and your system detoxifies. Exercise, saunas, drinking extra water or detoxifying teas, and herbal supplements may be helpful in facilitating the detoxifying process. helpful in addressing brain fog related to Lyme disease, fibromyalgia, chronic fatigue, radiation treatment, and chemotherapy. ​How do I get to access Hyperbaric Oxygen help for my health? ​First you will need to book a thirty minute HBOT Medical with one of our Registered Healthcare Practitioners to check your current health status and determine the optimal QRS mat and HBOT chamber protocol and frequency for you. We will also recommend a follow up assessment with your practitioner at certain intervals during your chamber sessions to check on your progress. ​How should I prepare for treatment? Before each mHBOT session we recommend you either see one of our osteopaths or acupuncturists for a treatment to balance your nervous system and improve blood flow, or have an eight minute session on our German designed and manufactured QRS mat which provides a low frequency pulsed electrical magnetic field to prepare your body by opening up the ion channels in your cell membranes. The QRS mat is included in the cost of your HBOT session. To enhance your treatment and especially in the case of conditions such as cancer, high dose Vit C taken just before you go into the chamber will assist the effectiveness of the oxygen flooding your cells. Bring in your own vitamins, ideally in powdered form, to mix into filtered water and drink just before your session or ask one of our hyperbaric technicians of the options available at the practice for you. In general, people benefit from good nutrition and a healthy lifestyle. Eating prior to your appointment is helpful in maintaining a stable blood sugar during your treatment. Please note that no food or drinks are allowed in the chamber; however, if you have diabetes, we ask you to bring a suitable snack in case your blood sugar drops in the chamber. We ask that you put your phone into flight mode before you enter the HBOT room. If you need to keep in contact, for example, with your child, our front desk staff will monitor your phone and let you know if they call. Wear comfortable clothing, ideally of natural fibres. You will need to remove belts and shoes before getting into the chamber. Have a drink of water and go to the bathroom, you don't want to cut your session short with an urgent need. Discuss with your Hyperbaric Practitioner if you could benefit from a pre-chamber vitamin boosting drink. Please inform your Hyperbaric Practitioner if you have any changes in health status such as a change in medication, a sinus or ear infection, or that you may be pregnant. ​Do I go on the QRS mat before or after my HBOT session? ​Due to the action of the QRS mat's electromagnetic field, we suggest you lie on it before your HBOT treatment. Research has shown that the Quantron Resonance System stimulates the action potential of the cell, increases cell functioning and metabolism. It opens the cell to oxygen, vitamins and minerals. However, the QRS will still benefit you after the HBOT if time didn't allow you lie on the mat before your HBOT treatment. There is also the option of coming into the clinic for a mat session only, just book with reception for 8,16 or 24 minutes. ​Can I communicate when I am in the chamber? ​Yes, you will be able to talk with your Hyperbaric technician at any time via the built-in intercom. You also have a buzzer. ​Can I control the chamber myself? ​Yes you can. Your technician will show you how to do this if you wish. They will also show you how to turn off the pressure at any time and how to press a release valve for quick decompression. ​How frequently should I receive treatments? 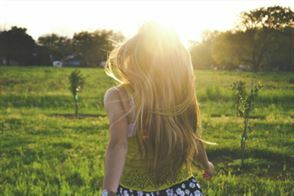 ​How many treatments needed will vary according to the type of health issue you are managing. Studies show that frequency of treatment is important in achieving optimal outcomes. A health issue that has only recently started or an acute injury such as a very recent concussion are likely to respond quickly. This is because long-term tissue and cellular changes have not taken place. Preparing for surgery usually requires only a couple of sessions and then follow-up as soon as possible after surgery to reduce infection rates and speed recovery. Sports people find that a session after hard training enables them to recover quickly and train harder. For very long standing/chronic health conditions our practitioners are likely to recommend an initial group of 40 sessions, 60-90 minutes in duration, 5-6 days per week. Your HBOT medical examination will enable your HBOT practitioner, in coordination with the HBOT Director, to determine what frequency, duration and reassessment plan would be appropriate for you, based on your particular condition/disease and current health status. ​Generally, mild hyperbaric oxygen therapy is very safe. Otic barotrauma (ear pain) can occur due to difficulty equalising ear pressure. It is typically quite temporary and easily controlled. Yawning or swallowing can remedy it—similar to what one would do when taking off and landing in an airplane. ​Are there any reasons a person should NOT go into a mild hyperbaric chamber? The only absolute contraindications to mild HBOT are pneumothorax and air-trapping emphysema. Other issues such as seizures, myopia (nearsightedness), cataracts, and oxygen toxicity do not relate to mild HBOT therapy as they are unheard of at pressures of 1.5 ATA and below. History of recent thoracic surgery; this is usually not a problem although caution should be taken as there might be air entrapped in chest wounds. If you are taking the following medications you should speak with your primary healthcare provider prior to receiving mild HBOT. Pregnancy is a relative contraindication. If you think you may be pregnant please speak with your Hyperbaric technician. ​What does mild HBOT treatment cost and what are the session times? ​The HBOT medical is $73 for 30 minutes with one of our registered medical healthcare practitioners who will then work with the HBOT Director to develop the optimal HBOT protocol and plan of care for you. We currently have a special offer of $55 for your HBOT medical if it is booked in with your initial HBOT chamber session on a Thursday with our Hyperbaric technician Kerry Summers. If the cost of the mHBOT is too much for you, please let Melanie Young, our Hyperbaric Director, know as we try to help people to access the treatment they need. We especially provide discounts for children. Our chambers are supplied by powerful 10L flow oxygen concentrators at 93% concentration which is considerably more than the standard oxygen concentrator usually supplied with the chamber. We researched extensively and went to extra expense to find the best oxygen concentrator to use with the chamber. In our chambers at 1.5ATA and breathing in 93% oxygen, your plasma and tissue oxygen saturation is calculated to increase by 5-7 times. That is an average increase of 500% more oxygen than usual being delivered to your tissues. Also we only use medical grade silicon tubing throughout, plus medical grade silicon masks and cannulas for your benefit. ​Can I make an appointment to use the QRS mat only? What does the mat treatment cost on its own? ​Yes you can and it's a great way to steadily improve your health and to de-stress in your busy day. You can also have a mat session before seeing your health care practitioner, to clear away tension so they can get on right away with treating your health problems. ​Can I rent a QRS mat? ​Yes, please speak with your practitioner or our practice Manager Bev as there is usually a wait time to get a mat. The minimum time to rent is four weeks and the cost is $100 per week. The wonderful advantage is you can use it before you get out of bed, any time of the day you are at home, and to help your quality of sleep at night. Alternatively you can purchase your own mat. Please speak with your practitioner if you are interested. ​It’s hard for me to afford the treatment I need, what can I do? ​If you are having trouble managing financially, then please speak with our Practice Manager, Bev Wong. We may be able to provide a discount for patients who need many ongoing chamber sessions. We have been known to give discounts for children and people in sincere need on a case by case basis. Crowd funding has also been a successful option. ​How can I learn more about HBOT? ​A comprehensive book about HBOT is ‘The Oxygen Revolution’ by Dr Paul Harch, M.D. This book is now onto its third Edition and is for individuals who would like to learn more about how HBOT works and what conditions it treats. The book explores the science behind HBOT, as well as case histories of people who have benefited from HBOT. You may like to take a look at the research below and also research online, just google HBOT and the conditions you are interested in. In cases of head injury, it is always recommended to so to the emergency department or see your GP to have a concussion assessment and possible referral. For recovery, probably the most important factor to restore to a damaged brain is neuroplasticity (how well neurones communicate to each other). One important step in restoring optimal neuroplasticity, comes from the removal of any restrictive forces on the brain and surrounding structures using gentle cranial osteopathy, which allows improved CSF flow. Combine this with mild hyperbaric oxygen therapy to reduce oedema (swelling), increase the oxygen levels to the brain cells and reduce inflammation, reduce cell apoptosis and help re-awaken mitochondria, which are the energy cells of the neurones. Every patient at City Hyperbaric undergoes a concussion questionnaire and is thoroughly evaluated to highlight their respective physiological and functional restrictions. Osteopathy can gently remove restrictions that could prevent proper blood/CSF flow to the brain. Some of the common restrictions are: tightness in the dural membranes around the brain and spinal cord, rigidity in the areas of brain that received the trauma, compensations in the vertebral column and cranium. We find utilising mild hyperbaric oxygen therapy and cranial osteopathy together works well to facilitate recovery for the patient. —Clinical Journal of Sports Medicine 13 (3): 138-147. 2003. Conclusion: In many cases of sports injury, surgery is often required. Treatments that can speed up the healing process are of greatest interest to the patient and the doctors. The advantages of HBOT are the known benefits in reducing swelling, decreased inflammation, improved collagen deposition in the skin and increasing the growth of new blood cells. —Journal of Applied Physiology 106 (2): 711-728 2009.
the time to recovery, complement surgical procedures and enhance the outcomes of physical therapy. As many professional sports teams have discovered, HBOT is a real tool to enhance their performance and reduce their down-time from injuries. Conclusion: The clinical results indicate that HBOT can lead to significant neurological improvements in post stroke patients, even at chronic late stage. The observed clinical improvements indicate that neuroplasticity can still be activated long after damage onset. Conclusion: There is strong scientific basis for oxygen treatment as prophylaxis against infection, to facilitate wound closure. This article reviews extensive data from human trials of hyperbaric oxygen and topical oxygen treatment. Oxygen supports biochemical metabolism and cellular function and has roles in combating infection and facilitating the wound healing cascade. Conclusion: Two systematic reviews have concluded that the use of HBOT in patients with malignancies is considered safe. HBOT alone has a strong anti proliferative effect on different mammary cells in vivo and vitro. 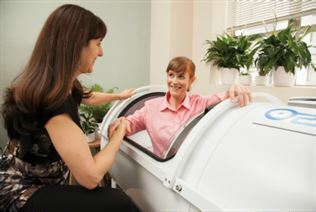 HBOT could be an effective therapy for breast cancer and this is supported by six studies over the last nine years. —The American Heart Journal, September 1998. Conclusion: Hyperbaric Oxygen Treatment (HBOT) in combination with thrombolysis has been demonstrated to salvage myocardium in acute myocardial infarction (AMI). Treatment with HBOT appears to be a feasible and safe treatment for AMI and may result in an attenuated rise in creatine phosphokinase and a more rapid resolution of pain. —Journal of Medical Gastroenterology. March 2013. Conclusion: In patients with Crohn’s Disease, 78% had clinical improvements, while all 39 patients with ulcerative colitis improved. HBOT lowered markers of inflammation and oxidative stress and ameliorated inflammatory bowel disease in both human and animal studies. Conclusion: The study provides evidence that HBOT can improve the symptoms and life quality of FMS patients. Moreover it shows that HBOT can induce neuroplasticity and significantly rectify abnormal brain activity in pain related areas of FMS patients. Conclusion: Hyperbaric Oxygen enhances glucose and lipid metabolism in the skeletal muscle, indicating that HBOT can prevent elevation of glucose and adipocyte hypertrophy. —Division of Surgery, University of Nevada School of Medicine, Nevada, USA. 1992. Conclusion: Many factors can delay wound healing such as oedema, infection, anaemia, poor perfusion and poor oxygen supply. The consequences of these factors is low oxygen tension, which adversely affects neutrophil, macrophages, collagen synthesis and fibroblast function during inflammation and repair. Hyperbaric Oxygen Therapy successfully negates these problems. Conclusion: The oxygen used under pressure, the oxygen as a drug may have extraordinary significance for better outcome of pregnancy implantation by improving endometrial receptivity. If endometrial receptivity is conditioned by adequate vascularisation and oxygenation, then hyperbaric oxygen is the treatment of choice. —Medicinal Veritas, 2 647. 2005. Conclusion: Children on the autistic spectrum experience improvement in a wide range of their symptoms with mHBOT treatments, including increased language ability, better socialisation, less aggression, improved bowel function and better cognition, to name a few. "The effects of hyperbaric oxygen therapy on oxidative stress, inflammation, and symptoms in children with autism: an open-label pilot study"
Conclusion: In this prospective pilot study of children with autism, HBOT at a maximum pressure of 1.5 atm with up to 100% oxygen was safe and well tolerated. HBOT did not appreciably worsen oxidative stress and significantly decreased inflammation as measured by C-Reactive Protein levels. Pre- and post-parental observations indicated statistically significant improvements in both groups, including motivation, speech, and cognitive awareness. 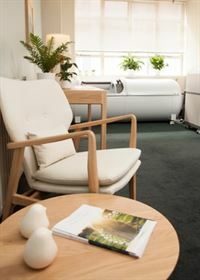 ​Ring our reception on 04 4991439 to book in for your 30 minute HBOT medical. Then you can usually get started shortly after that, as booking times allow.